Conor McGregor and Floyd Mayweather held a press conference Tuesday to kick off the hype tour for their boxing match next month. You really only need to know about one bit of "news" from the presser: McGregor's incredible, innovative, profane, legendary suit. 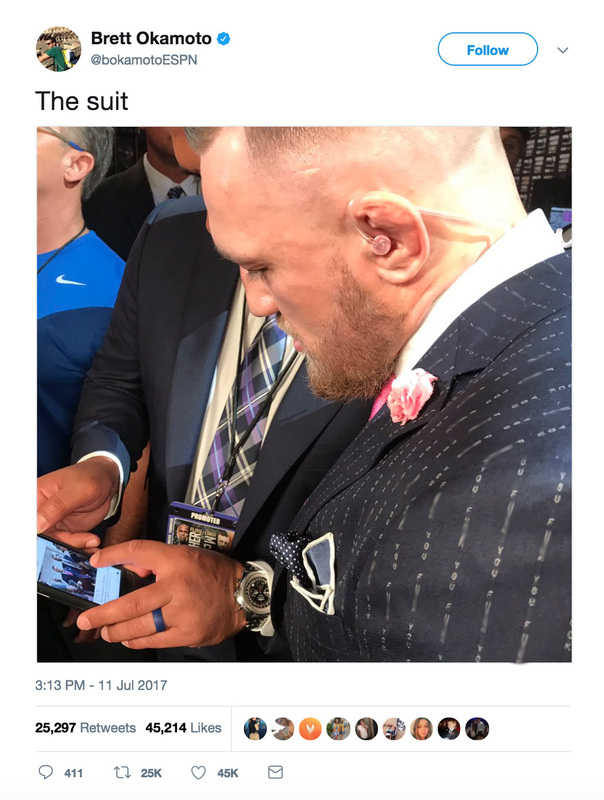 At first glance, it looks like McGregor's simply wearing a standard pinstripe suit. Not bad. But wait. Let's take a closer look, via ESPN's Ben Okamoto. Those pinstripes actually say "f*** you" over and over again. Repeat: THE PINSTRIPES ACTUALLY SAY "F*** YOU" OVER AND OVER AGAIN. Amazing. And just more proof that McGergor is handily winning the pre-fight troll war.